Share your experiences with beginners! While many people are looking for a “real job”, the diving industry offers many opportunities to develop. The diving shops and diving bases at home as well as around the globe offer many attractive opportunities for qualified employees. The work can really be “fun” and therefore it is not considered as work by many. However, diving shops, diving schools and dive centers are constantly looking for well-trained and motivated staff – a fact that offers good career opportunities. But remember: Only a professional and conscientiously trained diving instructor course will give you opportunities to do a good job after your education and for your entire career as a diving professional. In the OWSI / TL * qualification, you have to demonstrate your theoretical skills and pass a 40-question exam. Preparation-pool of questions is aviable at the course registration. 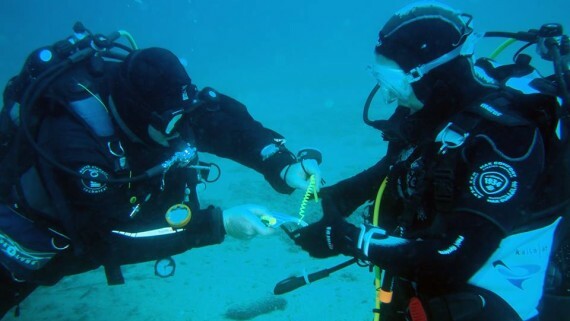 The practical part is also not too short, so in the 5 days you have to perform at least 6 dives. We recommend the participation of the preparation week! Qualification for their life as a dive instructor to do a good job. Orientation, group guidance, deep dives and CPR / O² worth 569, – € free of charge.